This is all about celebration – the funny, the romantic, the eccentric and the beautiful. 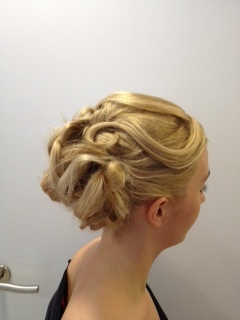 We will be busy in salon all summer doing the hair of brides, their parties and guests, grooms, mother-in-laws. You name them. They will look and feel great on the big day. We will share some of these lovely moments and hair styles with you on Twitter and Facebook. But we want to hear from you too. Tell us your best wedding moment. From your wedding or someone else’s. From this year or the past. We love humour as well as happiness. And we know that weddings are meant to make you cry (with delight). On the 15th August the person who submits the best moment will get a free hair-up for themselves and a friend. (Yes – men can enter and can give the prize to their nearest and dearests if they win). There are no restrictions on what you enter (photos are also acceptable) other than you keep it decent and you respect copyright laws and ethics. Link through to Twitter (@gillgoddardhair) with #LoveTotnesWeddings. Or hand it in at the salon with a smile. Mother of the Bride – and loving it! It’s only two weeks until Hanna’s wedding day and things are going very well. We have practice hair-ups dos once a week for Hanna in the salon which is great. It creates a happy atmosphere, not to mention showcasing Senior Stylist Kate’s bridal skills and Hanna’s beautiful hair. In fact Hanna has been growing her hair since she got engaged 18 months ago. She regularly shows me pictures of the amazing short haircuts she is looking forward to the minute the wedding day is over. I am really looking forward to the ceremony and the day. As Mother of the Bride I have been very well looked after by Hanna. She is not like me at all. For a start she is fantastically organised, she makes long lists of things to do. She has an easy going confidence in formal situations. And importantly she has approved my outfit! I am very grateful for all this. I am really pleased to be included in the bridesmaids “something borrowed, something blue.” Mums over a certain age will know how I feel to be taken into Hanna’s bridesmaids’ (and best friends) confidence. For this I am really proud. I love my daughter, and I am really close to her bridesmaids. Her dad is over the moon about the wedding too. He has just returned from our Totnes Allotment where he has begun preparing his speech. The Kingsbridge Hill in May is really worth a mention here folks! The wedding dress is now hanging up in our spare room with a freshly laundered sheet covering it. Our family are banned from using the room. Two weeks to go – of course I keep sneaking a peak at the dress. She will look beautiful in it.